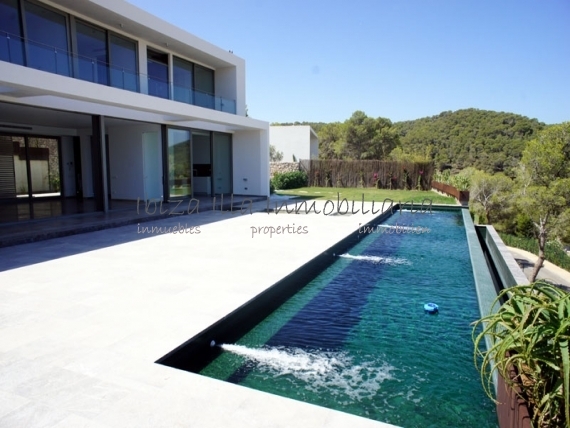 Fantastic modern style villa with wide spaces, straight lines and lots of light, located on the top of a hill of the Roca Llisa urbanization where we find the only golf course of the island at just 10 minutes from Ibiza town. It has a tourist license, in a private urbanization with 24/7 surveillance. Upon entering the house we are surprised by a Zen garden with which we feel a sense of harmony. The house on 2 floors faces the golf course and the green hills on the horizon. It has a huge front room open on the front to the infinity pool surrounded by a beautiful garden and also onto the Zen courtyard at the back. On this floor there is the kitchen with utility room and storage room, a toilet and a suite with a large bathroom. The floors are dark marble with white veins, undoubtedly the undisputed elegant element of this magnificent villa. On the first floor we have 4 additional suites that make a total of 5 bedrooms with 5 bathrooms en suite and a toilet.